Effective January 1, 2006 Section 179D of the Internal Revenue Code, provided basic federal tax deductions as incentives to help make buildings more energy efficient. In 2013, energy efficiency tax planning has a special urgency. That’s because the current Section 179D tax provisions are scheduled to expire on Dec. 31, 2013. A proposal to extend EPAct for three years, through Dec. 31, 2016 has been introduced in the Senate. The proposal includes a new Section 179F, with a provision for a $4 per square foot tax deduction for so-called “deep retrofits.” It is also important to note that a 30 percent wind tax credit has been extended for projects commencing in 2013. Facility managers must take into consideration tax planning steps to maximize the current 179D EPAct provisions. There are also some no cost ways to plan for the potential extension of 179D deductions. The deductions for individual systems would increase to $1 per square foot. For the first time, wattage credits (allowances) would be provided for lighting controls. Perhaps the most important change in the proposed law is the creation of an option Property owners need to be aware the IRS has made it easy to recoup any missed tax incentives back to Jan. 1 2006 and understand the process for doing that. The Section 179D tax incentive provides for a maximum $1.80 per square foot EPAct tax incentive. For projects that don’t achieve a 50 percent energy cost reduction compared to the ASHRAE 90.1-2001 standard, there are tax deductions of up to 60 cents per square foot for lighting, HVAC, or the building envelope. The current Senate proposal would extend EPAct for three years, through Dec. 31, 2016. The proposal changes the baseline from ASHRAE 90.1-2001 to the 90.1-2004 version, and eventually the 90.1-2007. While the new baselines may be tougher to meet, a 50 percent energy cost reduction would qualify for up to $3 per-square-foot. Another important change in the proposed law is the creation of an option for designers to obtain this benefit for all building categories. This major development would enable REITs and nonprofits to use EPAct. 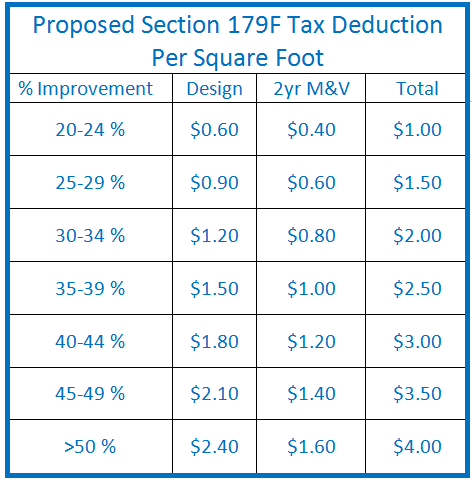 The Senate proposal includes a new Section 179F, which would provide a federal tax deduction of up to $4.00 per square foot for commercial buildings 10 years or older. With some effort, 179D will likely be extended and 179F will be enacted. Building owners, facility managers, etc. should let their Congressional representatives know they want this legislation passed. Anyone contemplating a fluorescent lighting upgrade should attempt to do it before the year end. That’s because the lighting only tax deduction will be harder to achieve with a baseline of the ASHRAE 90.1-2004 standard, which could be-come effective Jan. 1, 2014 if the Senate proposal becomes law. With some of the commercial energy efficiency measures, such as energy efficient lighting, the economic payback is often already quite favorable and the tax savings is simply intended to accelerate what is already a good business decision. Now is the time to take a close look at tax planning considerations, whether that is maximizing the current 179D EPAct provisions, recouping any missed tax incentives back to Jan. 1, 2006, or planning for the potential extension and expansion of energy-related tax benefits.